Larry Plecha knows the difference between controlling burrowing rodents and simply making the problem go away until another day. 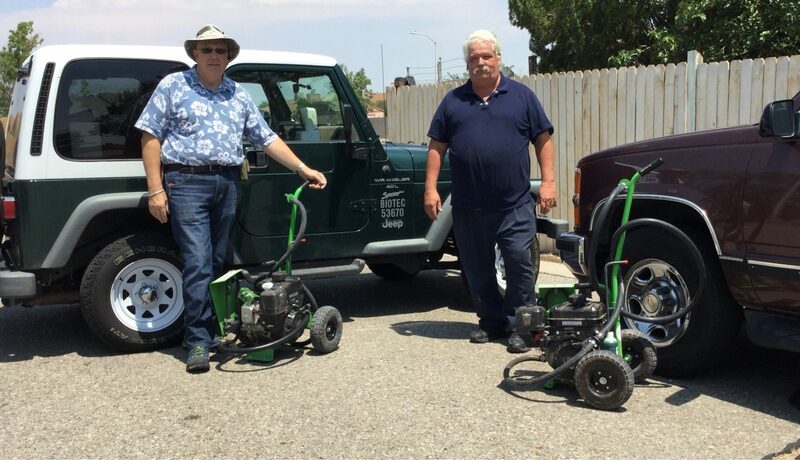 For more than 30 years he’s been servicing both rural and urban areas throughout New Mexico, providing all types of pest control with a large amount of his calls asking for burrowing rodent assistance. Prior to being the happy owner of not one but two BurrowRx units, Plecha would dig up burrow tunnels with a shovel and use traditional pesticides as a form of control. In wide-open New Mexico, that allowed some rodents to create new burrow and tunnel systems underground to escape from attention and control. In addition, the digging by hand was very time intensive. BurrowRx changed that immediately. The unit, which uses smoke oil to push carbon monoxide through even the most complex tunnel system, leaves no room for escape from a shaft once utilized. Plecha’s company Biotech provides general pest but burrowing animals are so prevalent they keep him very busy, hence the purchase of his second BurrowRx unit this year. New Mexico is full of mice, wood rats, pocket gophers, ground squirrels and prairie dogs. The prevalence of large prairie dogs means their tunnels are bigger than in other areas of the country, Plecha said. “The burrows are quite large and with so many stables in New Mexico, any horse that walks into a tunnel can break a leg and if you break a leg on a horse that’s the end of the animal as a rule,” he said. Because of the size of the tunnels in some areas, Plecha plugs the area around his BurrowRx hose with a towel, eliminating any chance for the rodent to escape. That allows BurrowRx to push the smoke oil throughout tunnel systems, providing strong, complete control. BurrowRx is easy to incorporate into any existing pest control operation. Plecha started with one unit and as he and his company were able to take on more burrowing animal work, he expanded with the second one and was able to use it to help provide a better service to his existing customer base. Designated as a pest control device by the Environmental Protection Agency (EPA), BurrowRx is a carbon monoxide device designed to control burrowing and tunneling animals, including gophers, ground squirrels, moles, rats, and prairie dogs. BurrowRx uses a smoke oil tracer to show where the carbon monoxide is going in the tunnels. As the carbon monoxide enters the burrow system, the rodent breathes it replacing oxygen in its blood and causing the organs to stop working. The product is unlikely to harm any nontarget species because once it completely dissipates, the carbon monoxide is no longer a risk to anything entering the burrow system. For more information about the solution for burrowing pests, visit BurrowRX at www.BurrrowRx.com or call (619) 442-8686. Also, visit the BurrowRx channel on YouTube. © 2018 BurrowRx. All Rights Reserved.